Facebook provides some major visual tweaks to its mobile platform. If you’ve felt that the Facebook mobile platform wasn’t as good as their desktop client, then things are about to take a drastic turn. Since a lot of users complained about Facebook app’s troublesome news feed, they’re finally making it more user friendly. In the recent turn of events, newsfeed in Facebook app has been overhauled to make it more readable and navigable as compared to older UI. The new changes include corrections in color contrast, larger thumbnails for links and new icons for reacting on links and photos. Another major change is the round profile picture thumbnails that will replace the blocky squares. 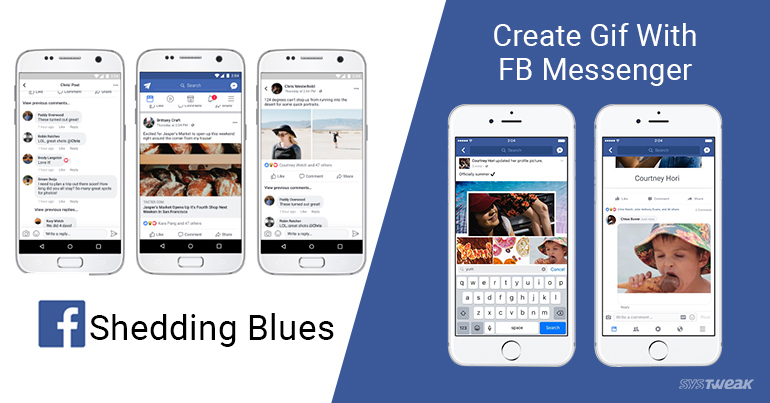 However, users will note that Facebook’s signature ‘blue’ theme has been toned down, aimed at reducing eye fatigue. Comment panels have also been replaced by bubbles making them reminiscent of chat bubbles. DID ANYONE ASK FOR THESE CHANGES? Although Facebook has continued to reinvent their highly popular platform since it’s inception, these new changes might be able to provide users with a breath of fresh air. This also reduces problems such as fake links and clickbait, as link preview will now cover the entire screen. Making screens more white compared to blue will certainly cause less strain on users eyes, especially during long browsing sessions. Users will now be able to create GIFs and share their stories. THAT SOUNDS GREAT, MORE DETAILS PLEASE? After months of avoiding the ‘stories’ feature like other popular social media platforms, Facebook have finally introduced this along with some cool new additions. One of the major new additions to its camera module includes the ability to create GIFs and share them. Users can simply swipe to FB app’s camera and record two-second videos that can be shared as GIFs. Moreover, users can also start a live facebook stream directly from camera mode. BUT WILL THESE MAKE ANY DIFFERENCE? Although these features have been clearly ripped off from other services such as Snapchat and Instagram, Facebook’s decision to jump in this pointless rat race does sound rewarding. Their live video sharing feature did gain some ground during its introduction but turned out to be more of an annoyance. Nevertheless, GIFs might totally turn the tide in Facebook’s favor as users had been clamoring for this feature since 2015.